Seed can automatically run the tests for your app. This is turned off initially, to allow you to set things up. 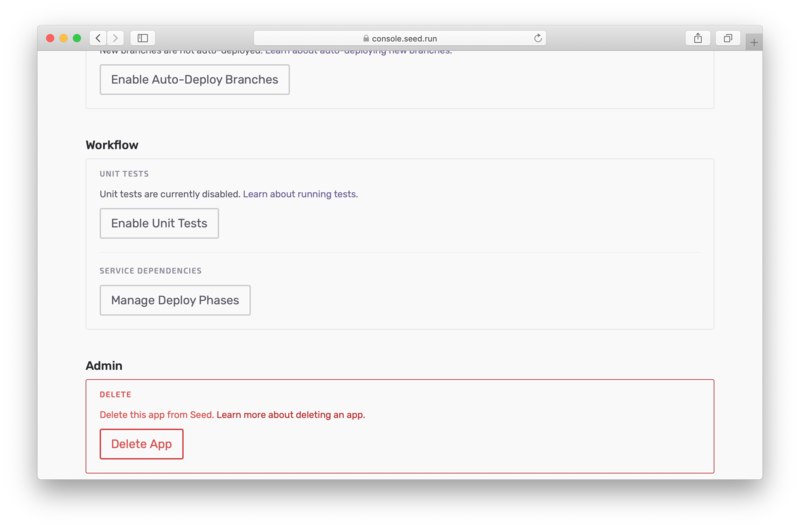 To enable running unit tests for your app, head over to your app settings. And hit Enable Unit Tests. Once enabled, Seed will automatically detect and run your unit tests using the commands for the language/platform you are using. For Node.js we run the tests you have defined in your project’s package.json for the test script by running the following as a part of our build process. For example, in your package.json you could have the following. Here we are using Jest to run our tests. If the test script is not found in the package.json, then the tests are skipped and the build is directly deployed. For Python we use the following command to run the tests in your project. This looks for the tests in the tests/ directory. Finally, Seed will deploy your stage if the tests pass successfully.